During the Tsunami of 2005 the ocean came rushing right through Sirris house in Ocean Moon and took pretty much everything with it. Anything that was not boalted to the floor ended up in a huge pile down the road. Barely anything remained inside his house but during the clean up Sirri came across a statue of Lord Buddha on the floor of the living room. No one knows where he came from as the ocean is at the bottom of the garden and it is speculated that the statue came in on the Tsunami. There are no houses or land masses nearby where he could have possibly come from and it did not belong to any of the Tourists who were staying there at the time. Many people were staying in Ocean Moon when the Tsunami struck and everyone survived the ordeal without a scratch. 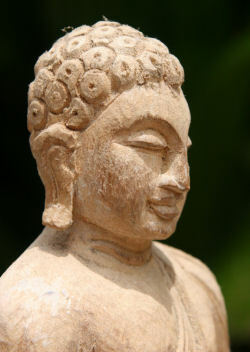 Was it luck or was the house blessed when Lord Buddha came in on the wave ? You be the judge but now Tsunami Buddha sits in Sirris living room in a place of respect and if you ask Sirri politely you might be allowed to see him.